When you’re your own boss, you can work from home, in the garden or even in your local coffee shop. This is the beautiful thing about operating your own business. No more rush hour commutes, meetings that drag on, and no more projects landing on your desk on Friday afternoon. Most entrepreneurs will probably agree on the fact that while working at home, it can get lonely from time to time. No matter how much you may like your own company, we are social creatures, and sometimes we need human interaction in order to increase productivity at work. But renting a traditional office is expensive, so what can you do? As the world is becoming increasingly connected, providing new networking opportunities to startups and technology gives workers more flexibility, so the new ways of working are becoming more popular, especially in Asia and in Hong Kong. Have you ever consider working in a coworking space? Coworking spaces are shared office space by independent, self-employed professionals, who are willing to work together in a collaborative, communal setting as opposed to the traditional model where employees of a single organization occupy office space. It offers an office-style environment that fosters all the autonomy an entrepreneur could want without any of the politics. In fact, coworking spaces bring several benefits to freelancers and entrepreneurs to put up their company in the competitive business world and facilitate business growth. If you’re still thinking about working in a coworking atmosphere, consider how these six perks could infuse you with new, innovative ideas and elevate your current projects. The first and foremost significant advantages to coworking spaces are that it allows entrepreneurs and freelancers with plenty of companies while still letting them retain their independence. According to a study featured on Officevibe in Hong Kong, a coworking office environment made 90% of entrepreneurs more confident, 68% of entrepreneurs more focused, and 64% of entrepreneurs more productive at work. When you break out of your comfort zone, you give yourself a chance to devise fresh solutions to existing problems. In a coworking space, where every entrepreneur and freelancers are busy with their projects, this buzz will drive you to make your own business a success. You will also find your brain is starting to work in different ways. Moreover, you’ll have access to professional amenities like fully equipped conference rooms, free wifi, a perfect place to sit that will help you in making the right impression all while increasing your productivity. The second benefit that is driving the demand of coworking office spaces is the flexibility and customization that they offer. Members of coworking spaces usually have the flexibility to set their own schedule and work when they prefer. There is no need to work around certain operating hours or on someone else’s schedule, which extends a perfect work atmosphere for ambitious entrepreneurs, workaholic, and freelancers. If you’re considering office space, you’ll soon learn the things that come along with it. And a coworking space takes care of all of that and allows you to rent the space on much shorter, and more flexible terms. A desk and chair depending on the membership level, this may be any available desk, a dedicated desk, or even a private office. The use of a conference room on a reservation basis. Free tea, coffee and kitchen facilities including a microwave and fridge. Access to a shared printer, scanner, and copier. Most entrepreneurs need plenty of company to stay happy and healthy; this means that staying at home can be counterproductive, lower their productivity, and can have an adverse effect on their mental wellbeing. Coworking spaces are well-known for offering its members a great sense of being a part of a community with like-minded people who have picked an independent lifestyle that matches yours. Even if they are working on different projects, you will leave feeling energized, social, and happy. It will also help you in eliminating this social gap and feed the entrepreneur mentality. Two things that you don’t have when you work for yourself at home or in the coffee shop is accountability or a clear structure for the productivity and profitability of your business. No line manager is looking over your shoulder telling you what to do, and there are no scheduled plans that you need to be in the office. But in a co-working space, you can get these things back, to some extent. You will have office space to work in the day that isn’t your small coffee shop table or a couch in your living room. You could even treat other coworkers of the coworking space like colleagues and can talk to them about your business plans and goals. The next benefit of working in a coworking space is that it may provide access to angel investors, venture capitalists, and other professionals. As a matter of fact, independent working is great, but sometimes it places a barrier between you and the people who could potentially help you in promoting your business. If you can find a coworking space that can put you near people who might have vastly different skill sets or solutions to problems, it makes this benefit all the stronger. While working in coworking spaces, you can enjoy excellent opportunities to mingle with other professional people who are in the same place as you or trying to grow their business. In this way, you can form a network and find relevant people for your businesses such as a potential client, business partner or a supplier. Maybe you need a new mobile app developer, a website designer, or a photographer for an special event; they can be just a few desks away from you in a co-working space and you can hire them for your work. One of the benefits of a co-working space is the supportive environment of people around you, who can share their experience, provide advice, and also be a source of motivation to keep you going for your future growth. So, if you’ve ever encountered self-doubt as a small business owner, don’t let it drag you down. In fact, surround yourself with fellow entrepreneurs while working in a coworking space and they will assist you to continue driving forward while providing emotional support. 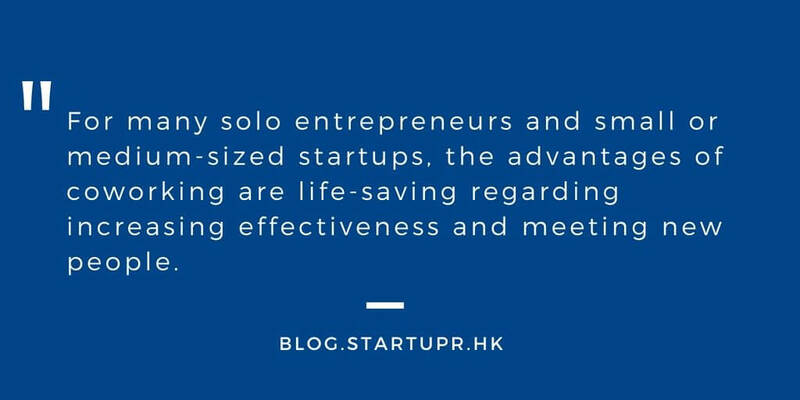 For many solo entrepreneurs and small or medium-sized startups, the advantages of coworking are life-saving regarding increasing effectiveness and meeting new people. With all the benefits provided by flexible coworking spaces, it’s no wonder that that more and more startups are separating away from the conventional office environment. So, if you are interested to know more about coworking spaces or looking for the ways to incorporate or register your business, head over to Startupr today!